CK One EDT 200ml. is a fragrance that is suitable for both men and women. Home » CK One EDT 200ml. 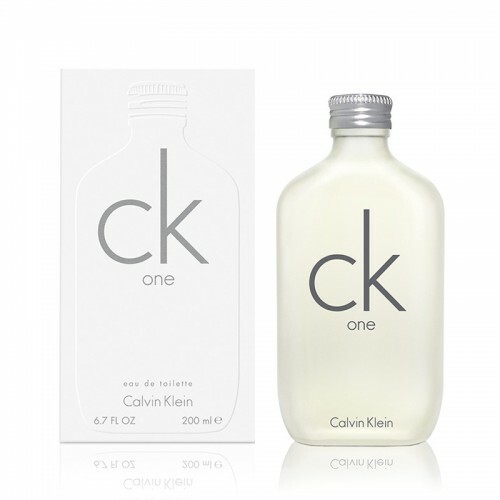 Product Code: CK One EDT 200ml. CK One EDT 200ml. is a fragrance that is suitable for both men and women from Calvin Klein. Delicate scent of perfume can be heard only on the skin. This fragrance has to close - a sophisticated and romantic. At the same time emphasizing individuality. Revolutionary, daring, unique CK One - fragrance created for her, for him, for the young people of the new generation. Fresh, fruity aroma of temptation, sexuality and freedom. Notes: Pineapple, mandarin, lemon, bergamot, papaya, cardamom, nutmeg, violet, jasmine, lily of the valley, rose, sandalwood, cedar, oak moss, musk, amber. by Calvin Klein - sensual and fresh citrus scent, intimate, quiet and relaxing - one of the best-selling unisex fragrances in 1994, some point of reference for a generation of the 90s. Especially popular at the time he becomes in the U.S.. Top notes are pineapple, bergamot, lemon, mandarin orange, green notes, papaya, cardamom. Heart notes: rose, violet, orris root, jasmine, lily, nutmeg. Base notes: Sandalwood , cedar, oak moss, amber and musk. In 2011, the campaign offers a whole collection of CK One : the aforementioned fragrance, underwear and jeans. Face campaign - Dutch supermodel Lara Stone, known for its forms. According to the company, "she wanted to show how well a variety of collections considerably on different people, so we took some jeans, a shirt, a great gray T-shirt - in short, a classic American style, and gave it to all the kids cool. " Besides Lara Stone in new advertising campaigns involving such well-known today, young and fashionable characters like Bambi Northwood-model Blyth, Abbey Lee Kershaw, Ruby Aldridge, Pixie Geldof and Alice Dellal, British boxing champion Robert Evans , singer Cassie, British model and dancer Jackson Blyton Megran and Swedish artist Viggo Dzhanason.